These restaurant menu covers have an easy slide-in setup for effortless updating. The 6-page wine list holders are designed to hold 6 double-sided 8.5" x 11" sheets, totaling 12 different views. 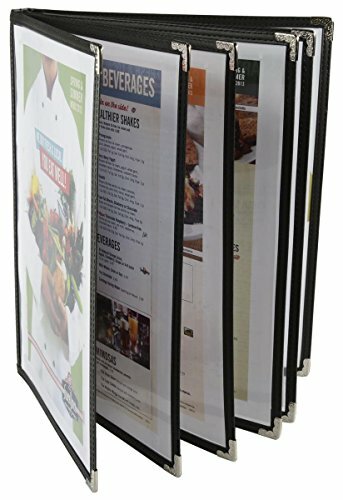 These restaurant menu covers are made from PVC plastic and feature a black synthetic leather trim to perfectly frame each displayed entrée list. The 6-page wine list holder also includes metal corners for added strength and style. 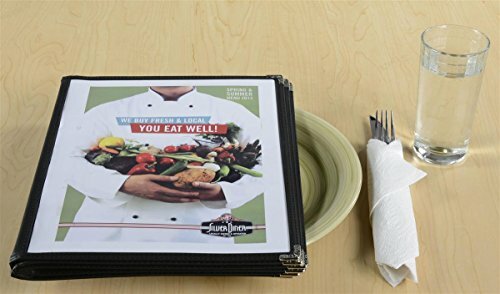 These PVC plastic menu covers feature a book-like design for easy browsing. The simple 6-page holders work perfectly within any casual dining environment, yet are classy enough to work in a high-end restaurant as well. 6 pages hold 12 entrée lists. Slide-in loading makes it incredibly easy to update a menu selection. Book-like folding allows for effortless browsing. Decorative metal corners added for strength and style.